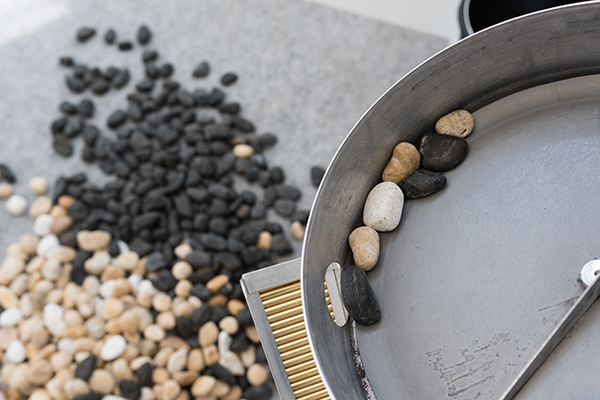 The Sisyphean Stone Machine repeatedly separates a pile of pebbles by their colors, from the darkest to the lightest. The machine makes a persistent effort to control and structure the un-structured. This effort may be considered pointless as it goes against the forces of nature. Despite the enduring attempt, as time goes by the stones diffuse and the order is broken. The machine mechanically controls the movement of individual stone, separating them from the large and heavy pile, moving them along conveyors and through a sensor that detects their colors. This process is not trivial due to the variation in the stones’ sizes and shapes. As in a biological homeostasis processes in living forms, aiming to direct chemical reactions in order to keep the living unit alive, the machine is endlessly trying to organize and control. 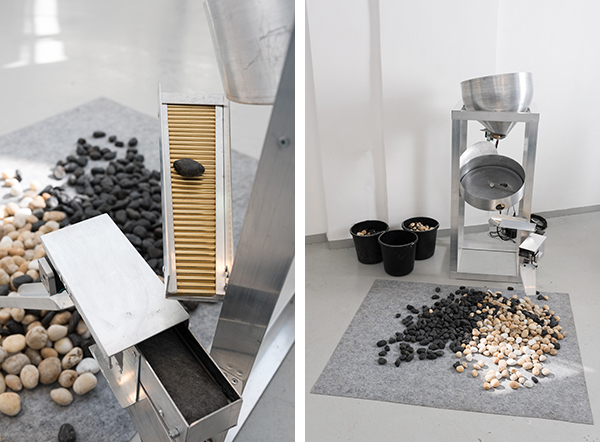 Stone Machine was exhibited during the event ‘Stone, Silicon’ at Art Space Tel Aviv, February, 2016.